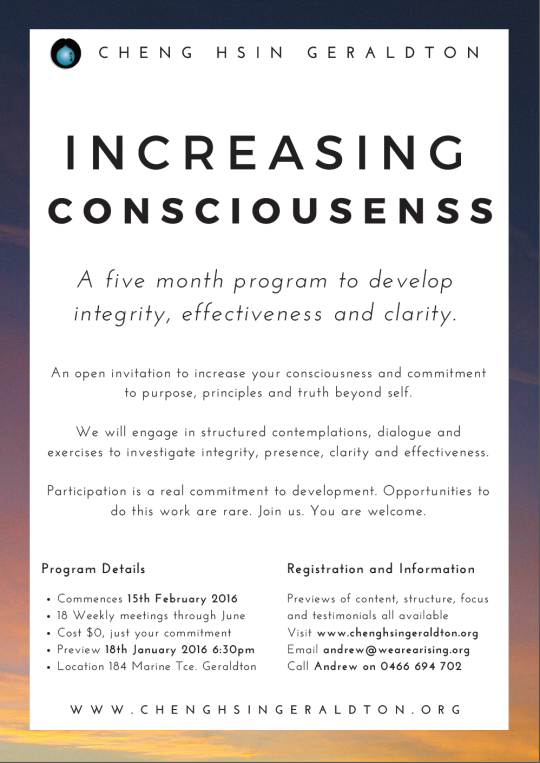 Congratulations to the participants committed to the Increasing Consciousness Group commencing Monday 15th February. It’s impossible to know the outcomes of this for each person and us all, but from the preview sessions and communication since the clear intention is for a significant transformation. Based on interest in the previews and online from people who weren’t willing or able to commit this time, an email list has been created for sending updates. You can join by emailing chenghsin@wearearising.org. Emails will be sent about once a month with dates for upcoming local and global activities, learnings from past courses, and alerts about new blog posts, newsletters or books. 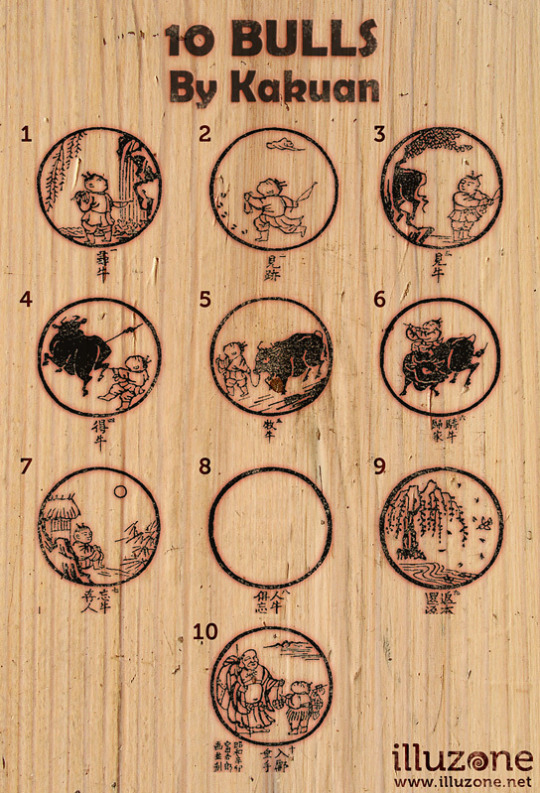 A story around the “Ten Bulls” and a foundational experience for Cheng Hsin. These really are highly recommended, the stories and Q&A give you an experiential insights into the nature of this work. Calendar of all global Cheng Hsin events, eCourses etc – find a date, location and format that works for you. Consciousness, meditation and mindfulness are increasingly popular themes and memes in our culture. Despite having completed a dozen retreats over the past 10 years with different teachers that could lead me to think I ‘know’ something about this topic, my participation in a recent Cheng Hsin Contemplation Intensive (CI) in the Netherlands demonstrated how little I know, and what great power there is in really, really not knowing. Peter Ralston lead the CI with assistance from Kevin MacGee, one of his most senior students. Peter had his first enlightenment experience nearly 45 years ago and has been continuing to investigate and teach ever since. He’s authored several books in this field including the most recent ‘Pursuing Consciousness’. My experience with Peter is of being very direct and providing guidance and feedback that is perfectly appropriate to the situation and person engaging with him. Relative to other teachers I am familiar with (esp. Vipassana /Goenka, EnlightenNext / Andrew Cohen, Gangaji, Genpo Roshi etc.) he and what he teaches comes across as being relatively free of any dogma, concepts or interpretations of experiences, rather focusing on the guidance to directly experience truth for oneself. He does communicate with a lot of personality, energy and his own views on particular teachings, teachers or other topics, and freewheels through some long and sometimes confusing (though entertaining) stories and writing. Peter comes across as quite ‘original’ and his teachings don’t reference or align with a single (or few) lineages, traditions or teachers. He does draw on stories, methods and concepts from Zen, Charles Berner, Esalen and a range of teachers and movements that he learned with and from. What stands out is the emphasis on each person taking responsibility for their own inquiry, and seeking direct personal experience of the truth regarding whatever is encountered. It’s not just that Peter recommends that approach, it’s the approach he has taken and continues to take. The brochure accurately summarises the rest of the format, the only difference being that the actual intensive seemed to be for 5 whole days (not just 3). By ‘intense’ I mean that, every moment (or every one of the 86,400 seconds) of each day was focused on contemplating the question at hand. I ‘held’ the question of ‘Who Am I?’ initially, then later ‘What Am I?’ through 12-14 rounds of 40-minute ‘Contemplation and Communication Exercises’ (CCEs) each day. These exercises are essentially ‘dyads’ with two people facing each other, taking turns to pose the question and listen to the response, or to contemplate the question and communicate what comes up. The questions were also held in every other activity: during stretching, walking, drinking tea, meals, waking, preparing for bed, Kevin would remind us to ‘hold your question’! The format for the CCEs is described in the brochure, and is consistent with what are described in Wikipedia as ‘Enlightenment Intensives’ and whose current format originated with Charles Berner in the late 1960s in California. This format is used by other teachers too, including Yoah Wexler in Australia. It combines meditation methods with the structure of an interpersonal workshop, with a koan for contemplation, space for silent contemplation, and also the non-judgemental presence of another human being. Relative to my experience of silent meditation, guided meditation of ‘collective enlightenment / dialogue / voice dialogue’ approaches, this format and process seems very effective and efficient at enabling direct experience of truth. Verbalising what comes up to my dyad partner required clarity, honesty and enabled me to quickly move on / move through whatever thought, distraction etc. it was and go further into contemplation. The presence of a conscious, human partner actively staring at you intently provides a presence for contemplation, and kept me attentive and engaged, which is different from meditation where ‘drifting off’ can happen more easily. Facilitating these retreats seems relatively straightforward in the format, however the Q&A sessions and handling the these most subtle investigations and open, intense participants is perhaps the most skilful work imaginable. It’s the bare focus, nothing else to do, absolute minimisation of distractions which seems to make this so powerful. And, the guidance of good facilitators: I went down some major rabbit holes for days at a time, and I experienced Peter and Kevin demonstrating mastery in their guidance of me and others. It’s no small thing to trust something with life’s most intimate and important questions. This format is intense. I love it. It’s mind-crushing and attention-focusing in a way that’s hard to describe (but i will try!). The contemplation of the koan took over completely as the frame and focus for my experience in every moment. I’ve never taken something more sincerely and surrendered to the task at hand more completely ever in my life. I ‘got’ who I am, directly, as in a direct experience of who I am. Doesn’t sounds remarkable to say “I know who I am”, but having gotten clear on it now pretty foundational for all of life, contemplation of further questions. And, while ‘What I am’ seems like an obvious and natural extension, it’s also an absolute mystery. Towards the end of the retreat, contemplating “what I am”, I took what I called the “arsonist approach” to contemplation. To me, this meant focusing so intensely on really not knowing, really intending to realise the truth, really contemplating that any thought, emotion, feeling, experience, judgement, memory, person, concept that arose was burned in the fire of my attention the instant it appeared or was recognised. Going further, I would use the arising of anything to ‘burn’ everything related to it e.g. a concept about what enlightenment is would be the trigger for me to discard that whole category of distinctions and associations to do with enlightenment. It is an extreme level of vigilance and attention on the question, not knowing and hard to describe even with metaphor or analogy. And, the other analogy I used is imagining a contemplation as a depression on an otherwise flat surface on which a “marble” as the object of contemplation sits. Anything that moves the marble (or attention) away from the depression is immediately addressed by bring attention back into the cradle of contemplation. Really “getting” what contemplation is and how to do it, especially being ‘open’, not knowing and honest feels almost as important as the content of realisation or insights. I say this because it seems to create the foundation for further contemplation, relationship to live, and the possibility to live life as an expression of the deepest truth of my realisation. And, there seems to be an endless variety of ways to contemplate. As in, the principle of contemplation may have many forms, as I experienced people in the dyads doing and thinking about all sorts of things. I noticed for myself that I am a really particular way, however don’t have to be that way. As in, the Andrew that I am could just as easily be any other participant or take any form, but what’s most enabling is trying to arrive ‘not knowing’ and ‘present’ in every moment. While knowing and knowledge and being habituated is relatively powerful, not knowing, presently is absolutely everything. There were many more insights about life, contemplation, attention, perception, experience and identity. For ‘me’ and in the every day world, relationships and works these insights seem so important and are transformational, but are of a different category being subjective and relational, rather than absolutely true. The bottom line is, I recommend a contemplation intensive! 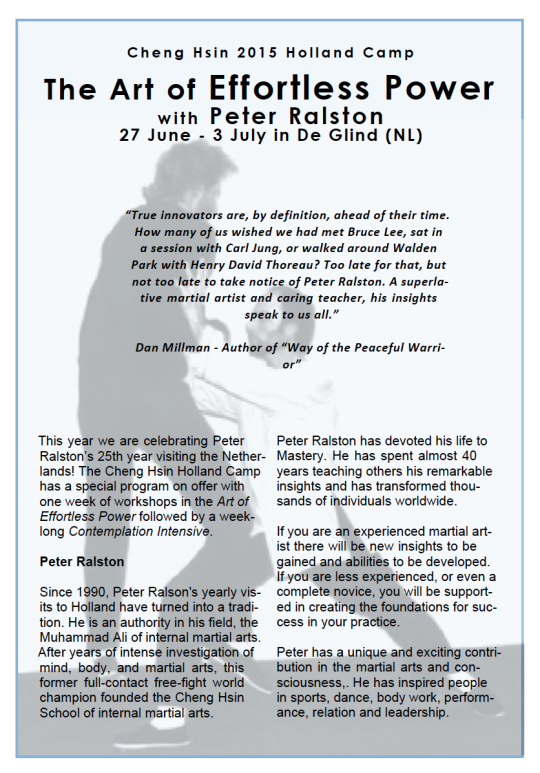 I recently travelled from Geraldton to De Glind, a small village outside Amersfoort, Netherlands, for two weeks of Cheng Hsin. The first week was an Art of Effortless Power camp. The invitation was to “a dynamic blend of T’ai Chi, Pa Kua, Aikido, Judo and Boxing with uprooting, throwing,footwork, and lots of internal work on relaxation, outreaching, intention, balance and freeing up ineffective mental patterns.”. You can review the the full flyer to learn more, or watch a few video clips of Cheng Hsin in action. A few things really stood out for me from the week. While sharing them won’t give you the direct experience of them for yourself, it may give you some sense of the aspects of Cheng Hsin that make it so appealing, fun and profound. What Mastery looks like. Peter Ralston is a Master. His level of skill and insight is beyond almost anything I’ve experienced of any other person in any domain, and he’s mastered two: martial and consciousness. We were also fortunate to witness one of his students, Brendan Lea, pass “Kyu 25″ during the camp. 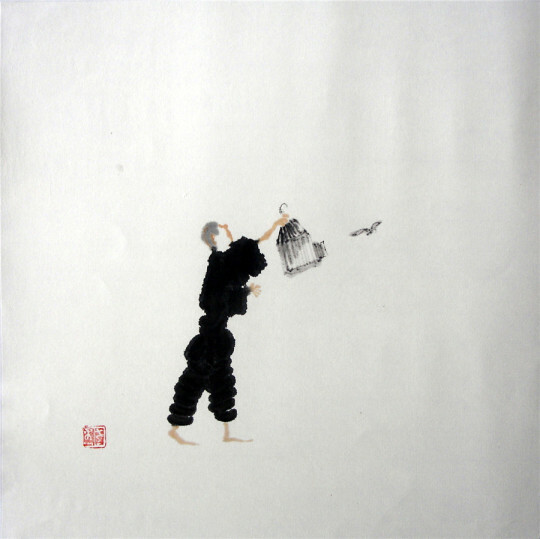 This essentially demonstrated his own Mastery of the entire art consisting of hundreds of techniques from throwing to boxing. Almost the entire week I was in complete awe in comprehending and appreciating the commitment, skill required to really Master anything at the level some of these people have. To say I was inspired almost feels too separate…perhaps deeply affected by such an intimate experience with a Master and left contemplating my own aspirations, life choices and priorities. How one’s attention affects movement and interactions. We played a lot of ‘games’ that isolate, combine and explore principles such as leading, following and effortless power. In all cases, where and how one is paying attention dramatically, instantly changed my effectiveness. In terms of simple ‘pushes’ to shift another body, the difference between experiencing another as immovable or having no resistance can be affected deeply by where and how I am paying attention. The same applies to where my own centre of gravity is, whether I’m relating to the other person’s arm or centre, and whether I’m thinking ahead or really present with the body and sensations in this moment. Hard to explain in writing, but relatively easy to experience in action, and has a profound impact on effectiveness of interaction. Cheng Hsin’s applicability to other domains. While the Art of Effortless Power is primarily martial, practising the Zen Body Being principles really freshly reminded me of how they affect everything from how I open doors, how Roller Derby players could maintain their balance while bumping, what the act of ‘surfing’ a wave actually involves (weight shifts) and so much more. It’s really astounding the degree which I (and I suspect many people) live 24 hours a day in a body that we haven’t really thought about, investigated or figured out how to move and use effortlessly and effectively. The benefits of martial and consciousness work together. I adore the directness of martial arts and the immediate feedback: if I’m not really mindful and paying attention, I will get punched in the head or thrown to the ground. And while those are very gross examples, there’s many more subtle dynamics going on: from how one interprets instructions (e.g. ’relax’ or ‘yield’) through to the frustration and tears I experienced from being so resistant and slow at yielding and following another’s movements during the games. All these interactions show the ineffective habits of mind, how limited my awareness can be, and what ‘wholeness’, ‘integrity’, ‘not knowing’ and ‘grounded openness’ can mean experientially. Martial + Consciousness is such a powerful combination for me, and I suspect many others. What it means to be a good partner in learning. I learned so much from the other people at the workshop. Some were obsessed with outreaching, others practised non-stop during breaks, others were incredibly relaxed and every single one of them shared useful observations, guidance and direct and honest feedback. While I can imagine in some martial contexts people just sort of ‘go through the motions’ of exercises, the clarity of intention and level of awareness and attention of everyone participating was remarkable and incredibly valuable. There’s a lesson there for me about how I be a good training partner in any endeavour where there is a mutual desire to learn and improve in business, surfing or personal relationships. This post is to share the insights and shifts in attention resulting from contemplation of ‘purpose’ as part of the Principles of Effective Interaction course. It has been a very full-on week, but the benefit of this course and some of my practises are that they’ve enabled me to make sense of what’s going on (even if the reflection happens at 2am, or a day late). As a result I have a stronger appreciation for the why and how of clarity of purpose, infinite flexibility, integrity in body and speech (not just mind), dancing (as different from leveraging), and the power of purposelessness. To state the obvious truth of most interactions: without awareness or care, the (default) purpose of every interaction can often be about reinforcing one’s self-identity. While many of us, most of the time are doing this continuously (and without even being aware of what that self-identity is), many of us also have a sense of purpose or goals that we would say we hold as being higher and more important than pure narcissism. And, it seems that if I do have a defined purpose in this moment, or planned for a future interaction then I’m unlikely to be effective if the purpose is only written it down or verbalised and referred to occasionally. I’m much more likely to be effective and actually realise the purpose if I hold that purpose, inquiry into it, embody it continuously, and let go of any separation (e.g. separation of: ends and means; self and other; principle and practise). In addition to that very ‘present moment’ practise, my understanding of the purpose and effectiveness in realising it can be improved over time by also doing things in this present moment that enable conscious learning: collecting data and feedback and making time for reflection and planning to improve the alignment between my purpose for interactions, what actually happened, my experience and interpretation of the outcomes. The pleasure and clarity that comes from appreciating the sufficiency of this moment, purposelessly (and how powerful that is in enabling realisation of purpose). One practise that I re-discover each day with joy is 5 minutes of doing absolutely nothing. As mentioned in a previous post, being familiar with (if not always-grounded-in/as) the completely mind-blowing unknown truth and presence of this present moment: as birds chirp, leaves rustle, breeze pushes hair, buttocks rest on a chair I rediscover an immensity of no-thing and silence…and that somehow makes one’s purpose so much clearer, and one’s interactions so much more effective. Three weeks in to the Principles of Effective Interaction course (PEI) and I’ve been inquiring into responsibility. This blog post documents some observations and thoughts. 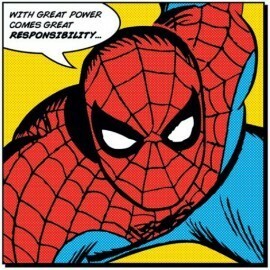 While writing I considered a derivation of the Voltaire quote (via Spiderman): “With great power comes great responsibility” — “With great responsibility, comes great power” i.e. one’s level of clarity and commitment is proportional to power and possibilities, in effective interactions. My primary context for the inquiries were professional relationships relating to social entrepreneurship (e.g. customers, members, partners, competitors, sponsors), though the inquiry also extended into physical training, daily work and personal relationships. What is ability and skill in this arena? What is my purpose and what would ‘winning’ be in this interaction? What must I and others do for the win-win-win-win potential of this relationship to be realised? I became much clearer about how responsibility, purpose and scope of roles and activities all contribute to effective interactions. This clarity has deepened and reinforced my understanding of personal and organisational practices (GTD, Holacracy, check-ins at the start and end of meetings etc.). It also showed up how significantly each parties understanding of the purpose of the interaction can dramatically effect perceptions of the behaviours e.g. whether the purpose of a meeting is to win, collaborate or grow a friendship dramatically changes your interpretation of anything you do in that meeting. The lure of ‘better’ must trump the satisfaction with ‘good’. Developing ability requires that my desire to be more skillful overcomes both the fear of losing and desire to hold on to what I already have e.g. relationships, status, money, positional power. Commitment may be the best way to reduce risk. Commitment to ability enables exercises and experimentation with a clear purposes and outcomes, which increases the efficiency and decreases the risks of those exercises e.g. One experiment at a time is better than doing many at once, due to the increased focus and attention. Responsibility is necessary in order to act appropriately and effectively. The likelihood of #winning outcomes is increased by responsibility for those outcomes. Responsibility is enabled by clarity of purpose and role in the interaction. Responsibility, plus some awareness and inquiry (on the part of the individual) makes it possible to interact appropriately and effectively (in a context) e.g. act appropriately and effectively to: enable buying (as a salesperson), enable training (as a coach), enable growth (as an investor). Responsibility and revelation are enabling of generativity. Responsibility also makes revelation possible. That is, my own clarity allows me to reveal that to others, and allows them to empathise, hold me accountable, give feedback, and to adjust their own behaviour or end the interaction. My own revelation may encourage clarification of their own motivation e.g. If I communicate that my purpose is to be a great trainer, then it may trigger the clarity in the other person about their relationship to being a learner / the one being trained. This also hints at responsibility and revelation being mutual (and even generative, for the benefit of me, others and all) not just causal or conditional. Saying I want to win probably increases the likelihood of it happening. If my purpose is to win in a competitive interaction, revelation of my purpose doesn’t necessitate any further unveiling of your tactics. Sharing and clarifying my purpose may increase my competitive advantage purely by reinforcing the focus of your awareness, without any requirement to go further and disadvantage myself by revealing all my tactics. Paternalism doesn’t help anyone (and is probably projection). If I say that my purpose is to act in the best interest of others, there’s a risk that I’ll get confused about my and the purpose. Acting ‘on behalf of’ another / principle as a patriarch, matriarch, martyr or moral adjudicator is very awkward, as I try to leverage or influence others behaviour in way that they may intuitively resist as you could be imposing a purpose on them that they may not have accepted, are not conscious of and that they can’t take responsibility for. This can be further complicated because even if you both agree the purpose for them, they are really the only one who can effectively take responsibility for their actions, access their experience, and assess outcomes. I had a sense of this when writing my New Year’s Resolutions, so am glad to understand these dynamics better. Outcomes can be achieved instantaneously. As soon as my purpose is clear, then I am free to move immediately to do the exercise, achieve my purpose and generate the outcomes. e.g. If I am in a fight and want to win, then I can aim to ‘win’ in the first second (and every subsequent second). Each of these thoughts requires further application and inquiry! But they have also had immediate impact, even if there were some serious ‘fails’ in my attempts at effective interaction this week. Delivery = maintaining integrity through delivering (instantly, if possible). Twice each year Peter Ralston offers e-courses, and I’ve just started the year-long e-course on the Principles of Effective Interaction. I’ll share what comes of it that may be of interest or benefit to others. The reason for doing the course is to access guidance from Peter, create the social conditions that enable my practising (deadlines, community, accountability), and to actually develop more skill. What I hope to get out of it is to understand what enables effectiveness, in self and others, especially in working relationships (and specifically where there is a sense of ‘#winning’ e.g. at the expenses of others, or where there is win-win-win-win alignment for all. The ‘arena’ (imagine a boxing ring, something with defined roles, boundaries) in which I’m focusing my practising is in my “Professional relationships as a social entrepreneur”, where I believe there are principles and values that require a level of assertion, aggression or activist-type behaviour such the interactions may have similar dynamics to fighting or dancing. Even in those interactions, I’m generally seeking a win for principles and for all, while also embodying values around connecting, collaborating and being community-minded. As you might gather from this explanation, this is an arena in which my objectives (by which I might asses what IS ‘effective’) role (what am I responsible for) and perception and explanation of the various situations needs improvement! Hence doing the course, and focusing on this arena. What I have accepted, in doing the course, is that I am responsible for interacting effectively, that it’s possible to change my being, thinking, acting, that this will require a high level of authenticity and honesty, and I must have a clear and accurate perception of the reality of what’s going on in the context of my interactions.